Navigations Through Scent - Rogart is a perfume by Molton Brown for women and men and was released in 2011. The scent is green-resinous. The production was apparently discontinued. Unfinished, unround, annoying - weak imagination of sweetened laboratory fir. I don't know who noticed it, but for some time now I've noticed a certain reluctance in me to test new fragrances, let alone comment on them. Perhaps my output in recent years has been enormously high, my desire to get to know new ones enormous. I feel very saturated at the moment and a few days ago I started to comment and rate wines (mainly red ones) at Instagram on a regular basis. That this Brown fragrance has already disappeared into the depths again may not come as a surprise in view of its peculiarly pungent and very unripe style. Peculiarly sweet (maple syrup) and vegetarian (angelica) aromas as well as pseudo-waldy aromas come together here - säuerlich edged, flattened and cleaned by a rather randomly mixed addition from the Iso-E-/Ambrox shelf. Annoying stuff - especially as on my other arm - almost frighteningly contrary - the wonderful remnants of Bogner's "Deep Forrest" are blowing towards me, which make it completely clear how moderately and bungling this Brown is. 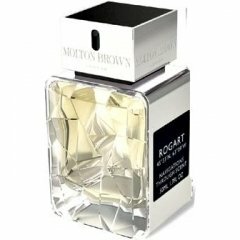 I purchased Molton Brown ROGART in Hamburg for 87€ after testing this and the 4 others from NAVIGATIONS THROUGH SCENT Series Fragrances.The best and more male scent was ROGART. Fantastic,rarely composition of a fresh wood Scent.Opening with citrus, green notes of a forest in canada and after one hours it leaves into a honey,balsam,woody ending.Warm and tender as for cold winter made.Forestmagic I call him now! A must when you want to be individual, cause there is no other comparable fragrance I know. It has a good longevity on clothes and deserves a try. The Bottle looks stunning IMO. Molton Brown is known for its body care products. Wherever good perfumes are offered, Molton Brown is not very far. Slowly, they are invading the perfume market, and with their latest fragrance line they top the middle price sector. Offering outstanding perfumes is easier said than done, and a critical view is always adequate if five new perfumes are presented at once. Rogart has made it to my skin, thanks to the attractive top note. That is woody-powdery, and it has this slightly musty quality like foxy paper. To cut a long story short – I was looking forward to having found a well made Dior Homme plagiarism! But all at once, the picture changed. A resinous note (Elemi?) completely took over, which was unpleasant from my point of view. It appeared very broad and opulent, and it was something that by no means I should like to wear. Okay, this is a matter of personal taste – but rationally observed there was not much more behind it. This resinous note stood in front of me like a block of concrete. No, I disagree with this change in style. This is not a consistent fragrance development. Both phases of the development do not really go together well, and the sudden change is not beautiful. Rogart is wearable only if you are attracted by both accords. Blame on those who do not test thoroughly before buying! Write the first Review for Navigations Through Scent - Rogart!